Lil Wayne Tramples American Flag in “God Bless Amerika” Video: Watch Here! Harmo: I can help you out. Young Olaf: With our mortgage? Young Olaf: Banking and farming don't mix. 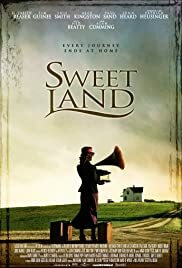 Q: Is "Sweet Land" based on a novel? As a total movie addict, I was very surprised after attending a screening of this film to be so overwhelmed by the quality of the photography and the depth of the acting. The visual images in this film are simple, yet breathtakingly beautiful in their composition. It is a rare masterpiece with amazing use of time, depth and perspective. The development of the romantic tension between the main characters in the love story was so powerful and yet so subtle, that it was like a fresh breath mint on a cold January morning. The used of time and flashbacks is amazing, and the editing and pace of the movie is very accomplished for an independent, low budget film. I will not be surprised if I hear about this move at Oscar time. 47 of 56 people found this review helpful. Was this review helpful to you?